Kekoa the wolf is a handsome young male who has a sweet personality, which is good because he loves to greet with wolf kisses. "Most of them will not be willing to socialize with people for very long if they are not allowed to greet you by licking teeth. I've watched people turn their heads away from a kiss, the wolves walk away, lay down, and not come back." 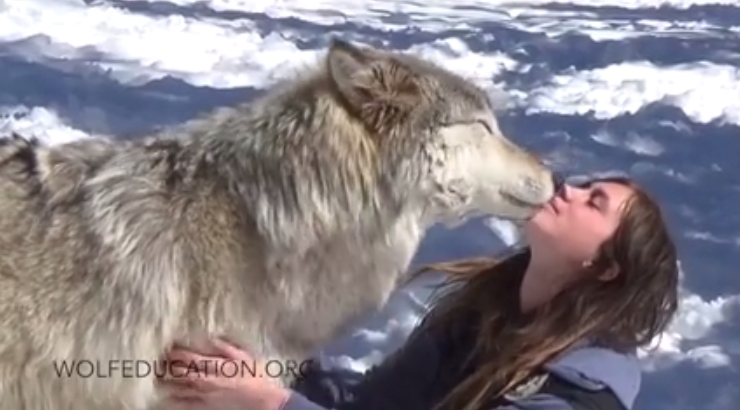 "Their breath also doesn't smell because they don't get fed kibble" said Colorado Wolf and Wildlife Center caretaker. Colorado Wolf and Wildlife Center mission is to educate the public through tours and programs about the importance of Wolves, Coyotes, and Foxes to our eco-system. They also educate the public about the importance of Preservation and Conservation of the forests, land, and water that supports wildlife, flora, and fauna for future generations to enjoy. They provide natural habitats and exceptional lives for the animals entrusted to their care since they cannot live in the wild. Responses to "Kissed By A Wolf: Tender And Loving Show Of Affection"